The most awaited app for Windows 8.1 PC or tablet Facebook is finally launched. After lunching of Windows 8 every major company launched their native app on Windows 8 platform. And everyone was asking when Facebook will launch their app on Windows 8 platform. But they did not launched Facebook Metro App for Windows 8 platform, they finally launched it on Windows 8.1 platform on that date when windows 8.1 final version is released. Yea Facebook today officially launched Facebook metro apps for Windows 8 PC and tablet. 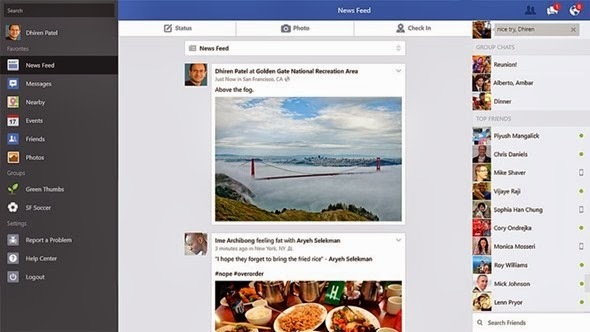 Before this Facebook app is launched in all types of platform like iOS, Android and Windows Phone. I did not know why they launched it soo late. Though there are some unofficial Facebook apps are available in Windows store. And you can grab any form list of top 5 Metro Apps to access facebook forWindows 8. But I think this Official Facebook will top on that list as Facebook developers makes this native app just awesome. They put everything that a typical user wants on Facebook app. This official Facebook metro app for Windows 8.1 PC or Tablet will give you better experience to access Facebook. From status update to photo upload, everything is concerned carefully. This app has location detection feature mean you can geo tag on every message you send or you make status update. News feed , private message , events and more you can access easily. Just scroll and enjoy. It feels better on touch user interface. So using Facebook Metro app on Windows 8.1 Tablet is cool. This 11.1 Mb app will add a star on your start screen. Having charm support in this app makes it awesome. So go and grab Facebook app now. Here I want to mention that this official Facebook support Windows 8.1 not Windows 8.1 , so if you have Windows 8 then upgrade it to Windows 8.1 and install it.